The mercury is finally falling these days in Delhi, reminding us of the fact that when large blocks of cement get cold, it isn't easy to warm them up! The problem with that, of course, is that most of us live in housing that consists of large blocks of cement. Yes, the afternoon sun is still wonderful, but the nights are chilly, there is no doubt of that. So what to do? Here at the Dhaba, we believe that some high-tech stuff is great, but when in doubt, low-tech is probably a safer bet. For example, everyone loves to love CFL light bulbs, but it's even more sustainable to turn off the lights you aren't using! So today, I offer a simple, time-tested solution for some of your heating problems: the good old hot water bottle. Hot water containers have been around for hundreds of years--before we had modern rubber, people used wood or metal or ceramic containers! Now most people in rich countries don't use hot water bottles any more, but we in the "developing world" still do. Why? Because they are cheap, efficient, and wonderfully comfortable. On those cold Delhi nights, nothing beats a blanket, a book and a hot water bottle! For those of you living abroad who settle only for things of the highest quality and fashion, I recommend FashionHot water bottles. You can get a Minky Swirls Plushy bottle for only $27.97! The bottles we get in Delhi aren't nearly so fancy, but they are less than one sixth the price of a Minky! Another example of Indian Green--Cheap and Best! Oh yes, if you have really strong lungs, some people say that in a pinch you can use hot water bottles to liven up your child's birthday party. I'm not sure I believe it, but this video does look convincing! Still, I do not endorse this idea--best to just buy the balloons, if you ask me! 25th Anniversary Day of Action worldwide events from Students for Bhopal. I can't agree more! Hot water bottles are simply the best. When I was in college in Delhi, I used to fill up, and hunker down with a book .....aaaaaahh! The rubber hot water bottle, without overstatement, is one of the greatest inventions of the last 100 years. I expect I am probably in a minority, when I say that I have never felt that they could be only used when the weather is cold. If they are filled with slightly warm water,(or even cold, as I have read elsewhere), in the summer months, they can be as equally as comforting on a summer's night, especially if one sleeps alone. Of coure, this may not be practicable everywhere. Hot water bottles, apart from warming, and easing cramp pains, have another huge benefit; they are superb for easing stress with their soothing warmth. I do not think that this can ever be over emphasised. I am speaking from first hand experience. I am writing from Europe. Whatever happens, please don't ever abandon the use of the hot water bottle. 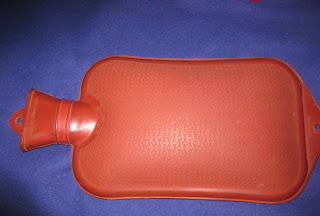 Some of the best EVER, are being made currently in India: Coronation Hot Water Bottles. Having used hot water bottles for most of my life, these are, without any shadow of a doubt, right up there with the best of them in terms of design and comfort. A lot of the so-called "developed" world is missing something unique, although, fortunately, this is not the case everywhere. So please, continue to enjoy evenings with a book, and a hot water bottle. I intend doing the same! @Anon. I don't plan on stopping. Glad you stopped by. Great tip. I will have to try this next time the temperature starts to drop.